I was helping with a therapeutic driving workshop today and something they said a few things that apply to teaching therapeutic riding that are logical yet easy to forget. 1. Have the sidewalker (or able-bodied whip, in driving) on their weak side so they can support the student if needed, especially if they start to slip toward the weaker side because the weaker side cannot hold their body up on a turn. 2. Start off the lesson turning toward their weaker side so they can use their strong side for support, which makes them more stable and therefore feel safer. For example, if your student is weak on the right side, start off walking the arena to the right so they can use their strong left side to hold themselves up against the centrifugal force that pulls them to the outside, their left, on a turn. If you were to start out turning around the arena to the left, the force would pull them toward their weaker side, which may make them feel like they’re going to fall off. 3. Later in the lesson switch directions to strengthen and stretch the weaker side. For the example above, switch to walking the arena to the left (or doing small turns, or whatever you are practicing). When the force pulls to the student toward their weaker side, encourage them to try to use the weak side to hold themselves up, or shift their weight a little to the inside in preparation. 1. You must try it out yourself first. Interesting Fact: What makes a driving bit. What makes a driving bit a driving bit is that they have several different places for rein attachments. 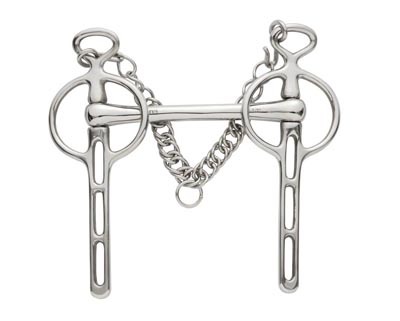 This comes from way back when, when people drove their horses here and there all day, and in the morning when it’s crisp the horse might be full of energy and beans and therefore need a slightly stronger bit, so the reins would be attached lower on the shank. But later in the day the horse might settle down and not need quite so strong a bit, so the driver could change the reins to a higher spot on the shank or even straight onto the ring. Basically, it lets the driver adjust the severity of the bit according to how the horse is doing, without having to change the bit. I thought that was interesting. How do you handle a student with a weaker side? Is there ever a reason to start the student turning away from their weaker side? What other questions do you ask before using adaptations?